. It really depends on what look you want, how much time you have, and how you're going to use the finished project. Applique with a turned edge will take a bit more time than fusible or raggy, but will have a lovely finished look and will launder well. This easy or some would say ‘cheats’ method of needleturn applique takes the scare factor out of needleturn. Most of the work is in the preparation, leaving the actual stitching as the easy bit. Fusible applique is extra fast and easy. With this technique, there are no seam allowances to turn under. Fusible web is available with smooth paper on one side and an adhesive on the reverse, or with paper on both sides and an adhesive in the middle. When you purchase a fusible-web product, take time to read the manufacturer’s instructions. Different products call for different heat settings and handling instructions. Be careful not to allow your hot iron to directly touch fusible web that is not covered by paper or fabric. I recommend using an appliqué pressing sheet to protect your iron. When all the pieces have been fused in place, finish the edges with a decorative stitch, such as a machine blanket stitch. Sew so that the straight stitches are in the background fabric, very close to the applique edge, and the swing stitch is in the applique piece. 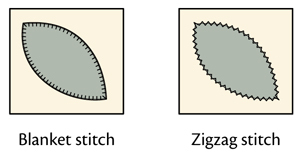 You can also use a narrow zigzag stitch on the edges of the appliques. I like to use a decorative stitch, such as a machine blanket stitch or zigzag stitch, to secure the edges of the applique pieces. The decorative stitch adds texture, depth, and color to the project. If I don’t want the stitches to show, I use a 60-weight, Bottom Line is a great applique thread, that matches the applique pieces. I use a 30-weight thread in a color that either matches the applique pieces or provides contrast.